This blog was updated (almost) daily for 10 years, from January 2007 to January 2017, and while it is now retired, there is a decades’ worth of information and videos here. Please search around if you’re planning your trip to St. John and looking for some ideas. Enjoy! –Jeff and Russ, authors. Today marks 10 years since the first On-StJohn.com post, and that’s pretty remarkable for a blog. How did 10 years fly by? Starting this blog was like catching lightning in a bottle, and it has been an honor for us to showcase this island and all the characters that fill up its stage. We’ve told you the stories of chefs and bartenders, shop owners and artists. 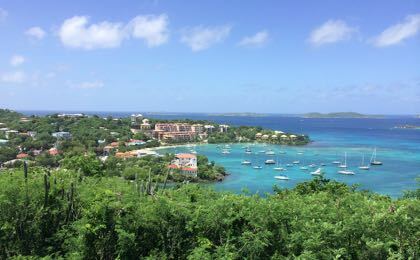 You’ve met life-long St. Johnians and expatriates making a new life on St. John, and the entrepreneurs who’ve tapped into the St. John vibe to turn ideas into success. We’ve talked to kids right off the boat – some who made it and some who did not – and the visionaries who knew decades ago how important balancing St. John’s growth with its special past would be. We’ve taken you in the air and under the water, and to some awesome neighboring islands. And we’ve also said good-bye to a dozen people, four dogs, a fawn, a duck and a one-eyed rooster. You’ve spent time watching the waves at almost every beach, and taken a Jeep ride on St. John’s roads. And you’ve soaked in the views at some of the island’s prettiest villas. You’ve helped us raise a little money for many good causes on St. John, and you’ve shared your vote on many of your favorite things. By design, the one thing we’ve never given you is any of the bad news. Or, actual news at all for that matter. There have always been other places for you to find that. Many, many thanks to all of you for somehow liking the story-telling we have done, and many thanks to our advertisers who helped us pay off the 13 credit cards that finished Bongo Bongo – a milestone recently achieved! St. John is the most wonderful place on earth, but it is also a bit like playing with fire. If you decide to make St. John more than just the best vacation you have every year, I offer this: St. John is a welcoming community full of people who want to help you succeed. Listen to them. There is a rhythm and a way things are done. This island chews up and spits out the ones who fail to get that. We were slow on the uptake and lost a limb or two ourselves. And “good morning” is more than just a pleasantry on St. John. It’s part of the rhythm. So, Good Morning On-StJojhn.com followers.Thank you for every single memory! 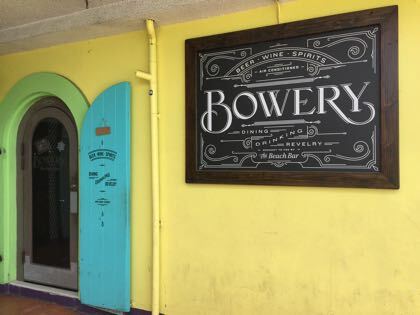 The Bowery, a nice looking little restaurant where Low Key was for years next to the Beach Bar and run by the Beach Bar owners, has been open for about a year now. 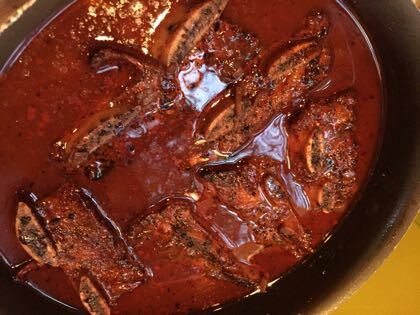 We really are horrible restaurant reviewers and still have not been so this is not a review, but there is a very common theme to EVERYBODY we have asked about it. This is apparently a good thing. It’s also a very unusual thing for a St. John restaurant. The Bowery also has a very slick website. Hat tip to your web guy. 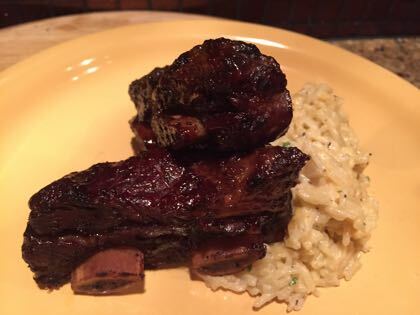 Check out the menu (looks like small plates – again not a review, but it sounds good.) The Bowery is also air conditioned. Have you tried this? 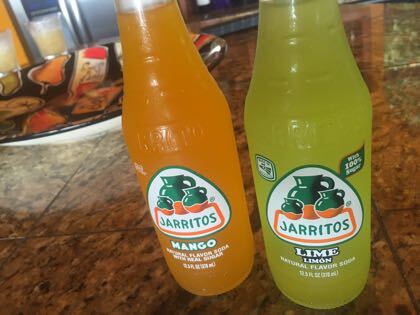 Jarritos is a Mexican soda you’ll see on St. John. It’s actually too sugary for my taste, and it’s super carbonated. I don’t think I could drink an entire bottle of this. But we’ll try anything with rum. Dark Cruzan (CROO-shun – you’ll break your habit eventually), cranberry juice, and mango Jarritos. 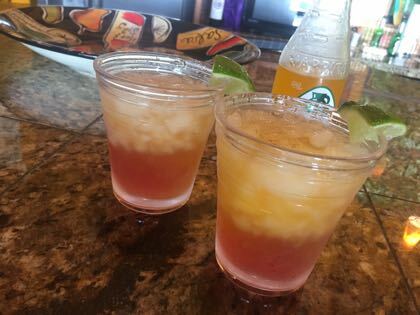 A Jarritos rum punch. This is both thoughtful and excellent marketing. 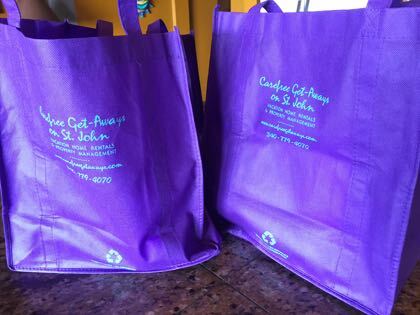 Carefree Getaways (and probably others) has stocked its villas with grocery totes, now that plastic bags are banned on St. John. If you don’t bring your own totes, or buy some at the store, Starfish Market puts your groceries in very awkward, handle-less paper bags. 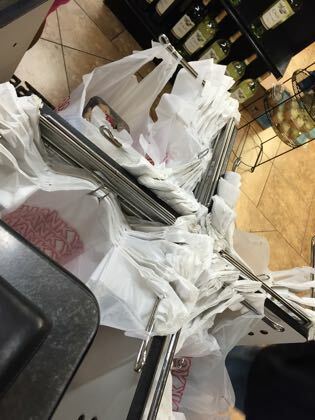 But St. John Gourmet Market is still spinning its carousel of double-bagging plastic. I’m not sure what’s up with that. But bring your own totes. Stay at a Carefree villa and you’re already set! 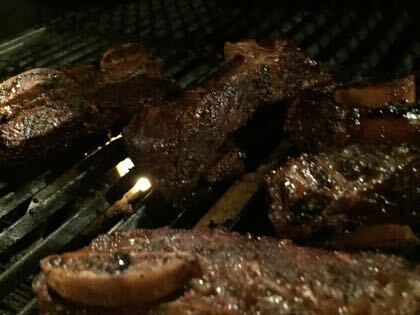 These Korean cut beef ribs, almost always at either Starfish or Gourmet Market, are cheap, cheap, cheap and delicious. 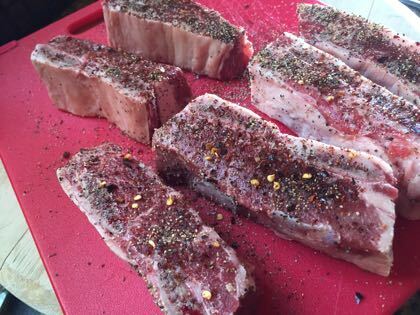 The secret is to hit the grill twice. 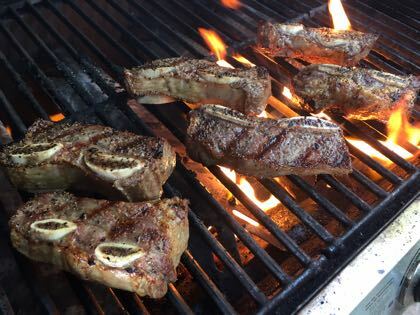 Seasoned and grilled to start. 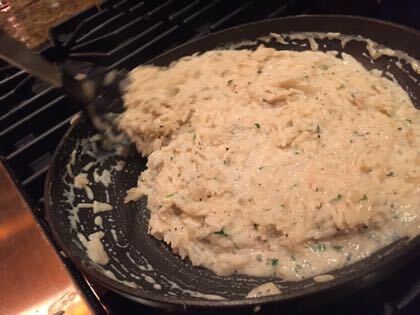 Then thrown on the grill a second time, while Russ stirs up some risotto. Bongo Bongo beef ribs at the end of an exhausting day of doing nothing. Yum. Or, more pleasantly-sounding, it’s an Andira Inermis, a tree native to the West Indies. 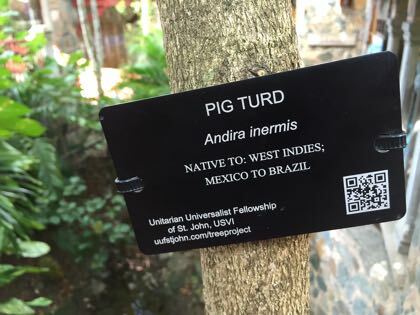 You would know this, because some of the trees at Mongoose Junction are labeled, as part of a project by the Unitarian Universal Fellowship of St. John. 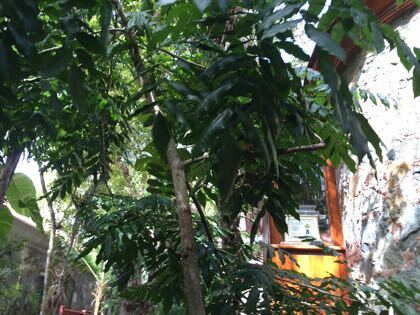 The group spent several months identifying trees around Cruz Bay and has put together a book with maps and pictures to help you identify them. 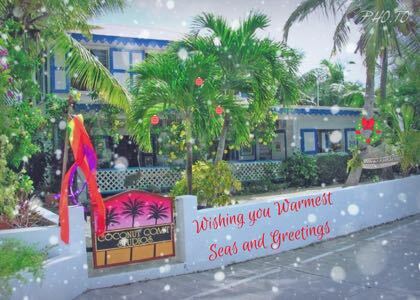 Another Seasons Greetings from Coconut Coast Studios and St. John’s finest artist, Elaine Estern. And our condolences on the loss of Elaine’s longtime companion, the chocolate lab Godiva, who passed away of simple old age this year. What an island life that dog had. You’ll still see Elaine and Godiva’s best friend Truffle on their daily walks and swims. 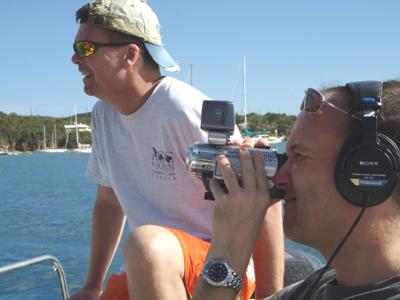 Stop by the Fish Frank Bay studio on your next trip and say “hi” to them! Some very clever meat marketing from Starfish Market. 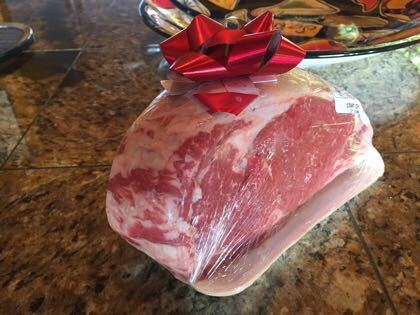 These mini prime rib roasts, complete with a holiday bow. And a very reasonable $9.99 a pound. Just salt and pepper. 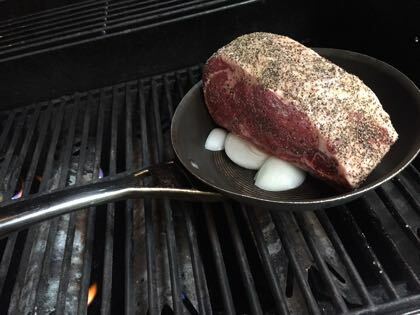 On top of an onion for the au jus. 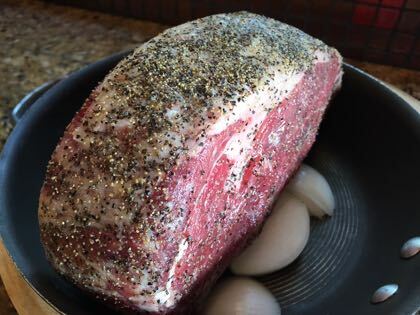 On the grill for an hour. One side hot. One side not. 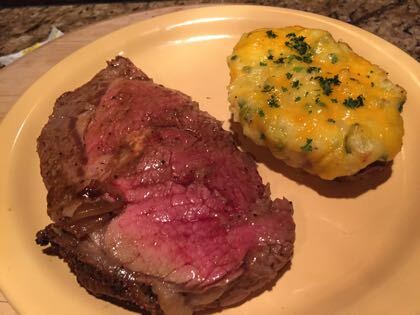 With twice bake potatoes with gobs of gooey cheese. Oh boy that was good!